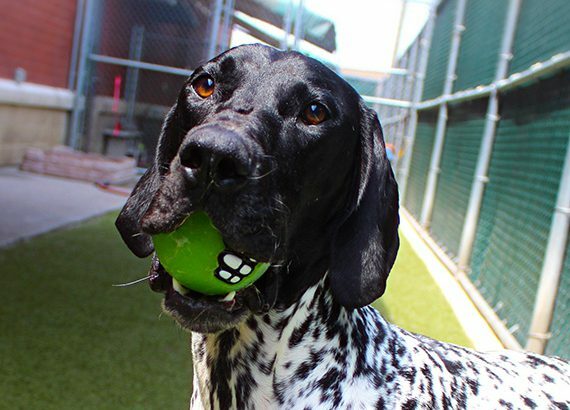 Myles is a 2 year old German Shorthaired Pointer. He’s been part of our Care-A-Lot family for about a year now. On his first day he was shy and skeptical, now he can’t get enough of daycare. When they pull up in the morning Myles' tail is wagging like crazy and he can barely contain his excitement. 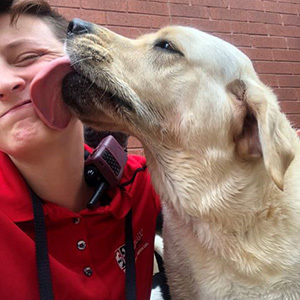 He is a fan favorite among the staff because of his love for the handlers and his large personality. His favorite things are his dog and human friends, tennis balls and trying to steal anything that he can get his paws on. At the end of the day he’s always excited to see mom and jumps right into her arms. Care-A-Lot Pet Resorts® includes over 12,500 square feet of indoor and outdoor space for our guests. They are able to play throughout the day in a home-like setting. Your dog will be free to socialize with other dogs while being properly supervised by our Camp Counselors in a cage-free environment. Our boarding guests remain outside of their kennels up to 10 hours a day. Any needed behavior modification is based on positive reinforcement and physical praise. With such a full day in store for your dog, and in order to maintain a cage-free environment, we understand the need for some quiet time. Naptime is from 1:00 to 2:00 every day. The dogs are provided with comfortable bedding, the lights are dimmed, the door is locked and no visitors are allowed. Our Camp Counselors are on hand to supervise while they rest in our indoor gymnasium. Dogs are neither admitted nor removed during naptime as disruptions can cause irritability, restlessness and discontentment amongst the entire group. We at Care-A-Lot Pet Resorts® believe that our guests are unique and strive to give extra special care during their stay; however, some pets may require even more care. We cater to the young, elderly, and special needs pets. Proper puppy care can be a daunting and challenging task. Puppies do not come with instructions nor do they follow the rules. No matter how hard you may try, puppies always seem to be one step ahead of you. 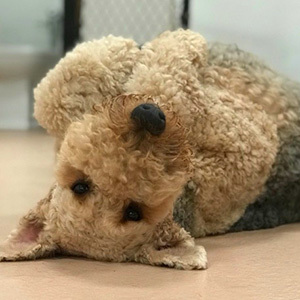 Puppies demand a lot of attention and we at Care-A-Lot Pet Resorts® strive to give our youngest guests the extra special care and attention they need during their stay. Older dogs are given the compassion they deserve. Their bodies are beginning to slow down and the wear and tear of their youth has started to take its toll. We at Care-A-Lot Pet Resorts® have the love and patience to help your older baby. We understand that your older pet tires more easily, is slower, may suffer from stiff joints and have the same aches and pains that we do. We take this into consideration. We make sure that your pet has a moderate level of exercise which will improve his circulation and keep joints moving. We also provide opportunities for plenty of fresh air and more frequent times to relieve themselves. Pets with medical issues or disabilities pose a great opportunity for Care-A-Lot Pet Resorts® Counselors to show just how special they are. We understand what a joy they are to you and that they can live a happy, normal life. 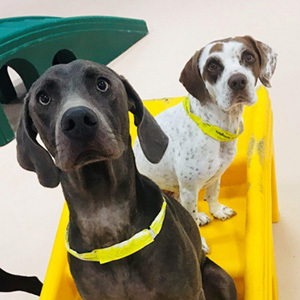 Dogs that are not accepted by other doggie daycare facilities are welcomed by our warm and loving staff. Throughout the day, your pet will be given exercise, attention and lots of love. 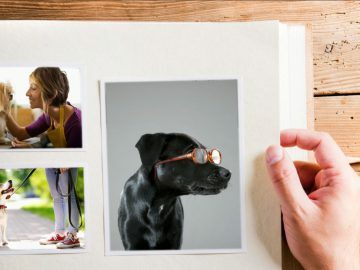 And of course, whatever your pet’s special needs are, we can provide individualized attention and TLC… from extra bathroom breaks for puppies, special feeding or attention for that older dog, or medication for your special needs pet. All dogs will receive exceptional care at Care-A-Lot Pet Resorts®. Care-A-Lot Pet Resorts® highly recommends placing reservations at least 2 weeks in advance, especially during peak seasons and holidays. Reservations are made on a first come, first serve basis. We encourage first-time guests to schedule their evaluation at least 48 hours prior to their check-in. We will do our best to accommodate last minute reservations. Care-A-Lot Pet Resorts® encourages owners to provide food in a labeled container, supplying enough for the entire stay. Maintaining your pet’s diet by bringing their own food will prevent any intestinal upset and help them feel more at home. It’s also beneficial to bring favorite toys, beds, and/or personal items. If these items are not provided by the owner then we will make them available to the guest.